aegif Labo Blog: Confidentialy: Public cloud or on-premises? Confidentialy: Public cloud or on-premises? 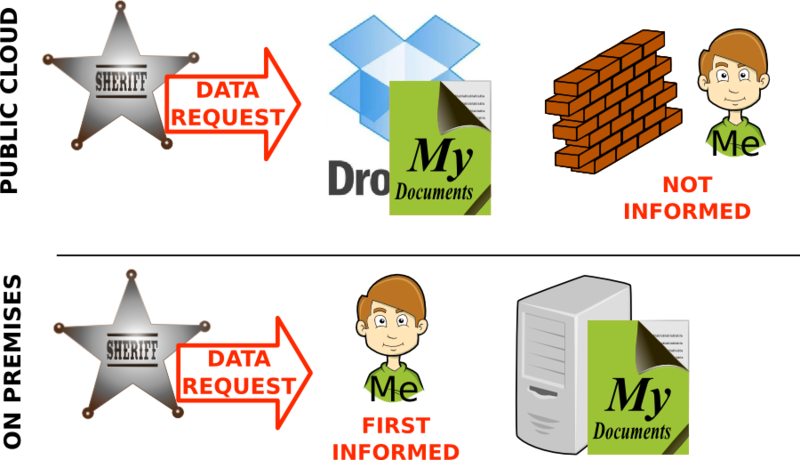 "Dropbox or on-premises, wherever your data is, the government can spy on it, so why bother?" Actually on-premises is slightly better: At least you will KNOW that you are being spied on. Public cloud: Police ask your cloud provider for the data, and you don't hear about it. On premises: Police ask YOU for the data. "Give us this user's data, but don't tell anyone we asked for it." An example of this got detailed in The Guardian last week: Google, after sending some of its customers' data to the FBI, waited 3 years before telling anybody. This is one more reason to prefer on-premises to public cloud.